Yet, while the vast majority of citizens in developing cities don’t own cars, infrastructure is still being designed and financed to support motor vehicle travel. In Mexico, for example, less than one-third of urban trips are made in cars, but three-quarters of the federal mobility budget is allocated to highways. Instead, streets should connect to other publicly accessible roads, including short blocks and four-way intersections. While developers might think their customers demand the perceived comfort and security of disconnected streets, dead ends are fundamentally unattractive to pedestrians and cyclists and force all traffic onto a few key roads, leading to unsafe conditions for motorized and non-motorized travelers alike. 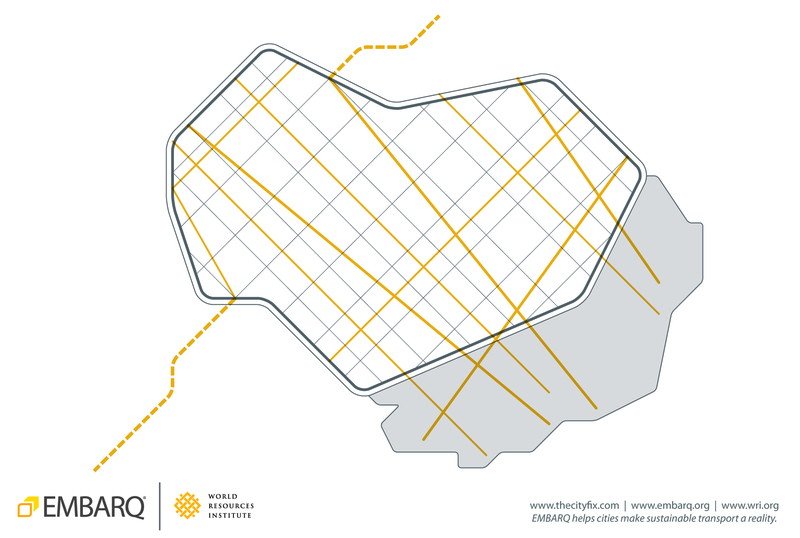 A street network ensures that neighborhoods are linked together, and that future developments connect to the existing urban fabric through the continuation of its grid. Not all streets need to be accessible to motor vehicles. Car-free or limited-traffic streets can become anchors for human-centered activity. Paved trails for walking and biking are not merely outdoor gyms, but are superb commuter facilities. They can be built behind backyards, through parks, or as part of a larger boulevard-style street. In order to be used for purposes beyond recreation, it’s important that these paths link to destinations such as businesses, schools, and public transport stops. The more vehicle traffic on a street, the more robust biking and walking infrastructure needed. Pedestrians need a flat band of sidewalk—called a “pedestrian zone”—free of obstructions. Wider sidewalks can also accommodate commercial activity and community interaction. Sidewalks are inherently social, and should be thought of as public spaces that happen to have a transportation function, rather than simply a way to get from one building to another. Bikeways should be smooth and free of obstructions, and preferably separated from traffic by parked vehicles, guardrails, bollards, or other barriers that clearly differentiate bike lanes from the rest of the street. (The NACTO Urban Bikeway Design Guide provides detailed guidance.) Bike racks and secure bike parking in public spaces are a great boon to bicyclists, who report that the risk of theft is often what prevents them from commuting by bike. 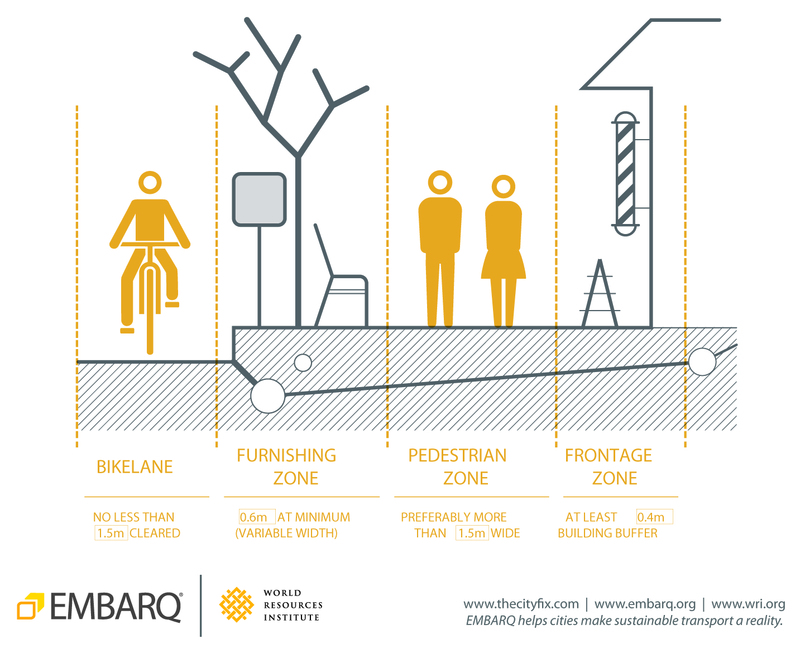 A balanced street has ample sidewalks, comfortable bike facilities that connect to a network, and safe ways to cross streets, making active transportation possible even on larger roads.